Ijen Crater, Banyuwangi Java Island not only popular in Indonesia but also popular in the world after the great volcano Mount Bromo National Park. Ijen Volcano produced huge sulfur from the crater dome and surrounded by green acid lake make the view very beautiful from the top. Mount Ijen is one of the most active volcano produces huge sulfur make the native people work spiritly every day as the sulfur miners, In which, sulfur laden baskets are carried with a bamboo hauling and start their job from Paltuding (parking lot) by trekking for 3 kilometers to the rim then continue to bottom by using traditional equipments. This Mount also said Kawah Ijen (in Indonesia laguage), located in the midlle between of Banyuwangi and Bondowoso regency. its elevation at 2,368 meters high above sea level with 200 meters deep, that contains about 36 million cubic meters of sulfuric water and settled between Mount Merapi (2800 metres), Mount Raung (3,332 metres) and Mount Meranti (3,325 metres). 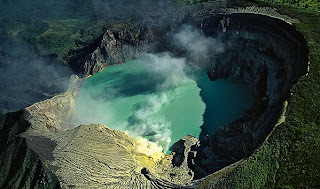 the nearest way to reach Ijen Crater is from Banyuwangi Ketapang Harbor or Airport for 2 hours driving and 7 hours from Surbaya airport or hotel. Mostly visitors usually take 3 days 2 nights with the combination trip between Mount Bromo and Ijen Crater tour. Blue Flame Ijen Crater is the typical attraction that relatively known by visitors, very regrettable if you do not visited Blue flame Ijen volcano, Blue flame is a nature process of the crater that occurred all nights begin at 18.00 PM and finish at 05.00 AM. it always appears everynight, most foreigners coming not only enjoy its landscape from the rim but also struggle to go down to bottom crater to see the amazing of Blue Flame.The views seem amazingly when it is flaming up from the crater dome seems like the gas stove about 600° celcius heat, it was created after the the last eruption occured. To enjoy Blue Flame Ijen Volcano, need to start from the nearby homestay such as Catimor Hotel, Arabica Hotel, Ijen View Hotel or you can start from hotel around Banyuwangi at 00:00 AM. Before you start your trip, Hope You bring jacket, gloves, mineral drinks, headlamp, gass mask, trekking pole, trekking shoes and long pants. In order You able make adaptation confronting steep route, mountain gass and cold temperature. Climb to Ijen volcano rim very recommended using the local trekking guide from Paltuding (parking area) becuase the road from the top to the bottom is more difficult and need a good strength to reach 3 kilometres route. Beside Ijen Crater, Banyuwangi Java Island, We also provide other interested place for East Java Island tour package. Detailly, You can read travel package option below. If You are interested to enjoy Ijen Crater tour and other interested places around East Java Island Indonesia, You can make the travel booking within 2 months before, In order We can provide your facility enoughly because this volcano always get heavy visitors. Detail information about Mount Bromo sunrise tour and Ijen tour package price, You can visit Our contact.